of Hands If your hands are constantly wet, you wipe them wherever you can, and you avoid a handshake. of Feet If your shoes and socks are wet, your feet damp, and the skin irritated. of Armpits If you have to hide sweaty armpits with dark colors of your clothing and when standard antiperspirants are of no help. of Head If sweating makes your life difficult and all you have ever tried did not help. Excessive Sweating of Back, Chest, and Abdomen If you suffer from excessive sweating of the back, abdomen, or chest. and Hands Are your hands and feet not only sweaty but also cold as ice? We know how to help you. Hyperhidrosis, as professionals called excessive sweating, is a disease that affects up to 10% of the world's population. It usually manifests itself by increased activity of sweat glands, and can torment the individual in both professional and personal lives. If you belong to this group of people, whose lives have been made hell by excessive sweating, we offer you a quick and lasting solution. 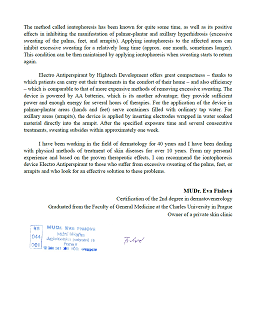 The connection of this server with the leader in the field of removing excessive sweating by means of iontophoresis, Hightech Development, created the first truly inexpensive and effective solution of removing excessive sweating. After reading through this website, you will find out that you can get cool and dry sooner than you ever imagined. 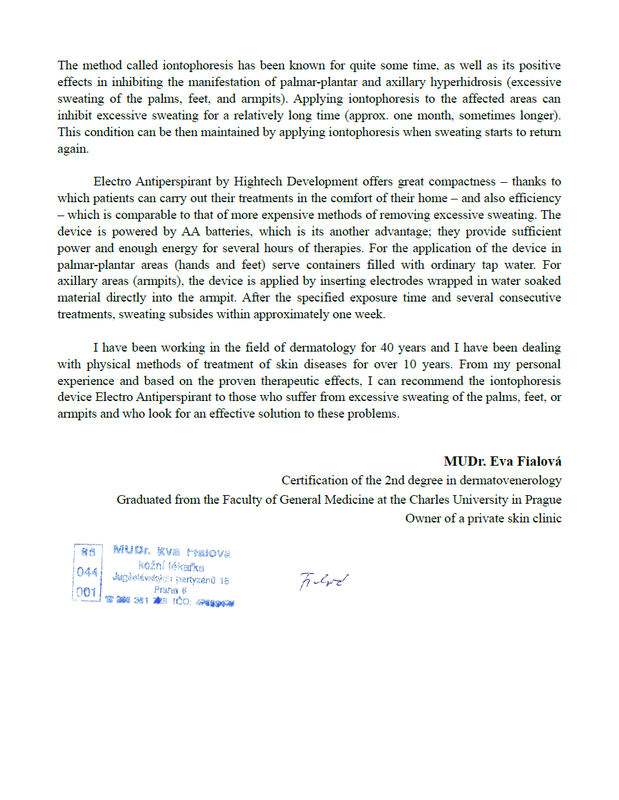 Electro Antiperspirant is an innovative iontophoresis device introduced by the Czech company Hightech Development. If you have difficulties caused by excessive sweating of palms, feet or armpits, you will certainly be interested in the fact that iontophoresis is considered the cheapest and most effective way of removing excessive sweating, not only in Europe but worldwide. With the help of Electro Antiperspirant, unwanted and excessive sweating disappears already after one week of use, and the treatment costs are close to zero as it can be powered by rechargeable AA batteries. Moreover, thanks to its very high efficiency, the device is offered with a 50-day money back guarantee. It means that you can test it without any risk, and in case of dissatisfaction, you get your money back.